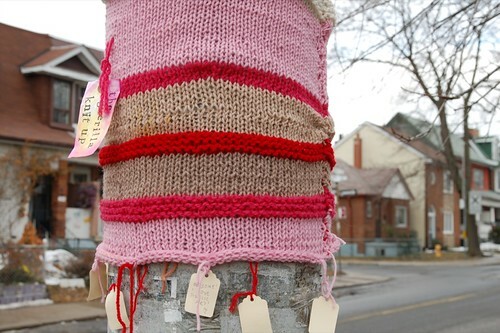 It seems perfectly timed that I spotted this Guerilla Knit Up on my walk down Brock Street to work this morning. A lovely blast of pink in a grey landscape. So pretty and cheery. The feeling of that stayed with me all day and then tonight I went to see the Toronto premier of the indie craft documentary, ‘Handmade Nation‘, by Faythe Levine. What a fun time seeing so many of you out at the screening and sitting packed in the Lennox Gallery together. I’m going to have to sit down with the Handmade Nation book over the weekend. There were so many people featured that I want to learn more about. I was particularly inspired by a patchwork dress they showed. It reminded me that I’ve been wanting to make a piece of clothing out of patchwork, so I’ve just put that on my list. Also, the opening credits were pretty fun and you can watch bits of it here. There was a crafty chat after the film, but I had to leave to pick up Maisy. Did anyone stay to discuss? Did you have favourite bits or people from the film? It really made me feel very proud to be a part of this community that is just bursting with talent and creativity. And thank goodness for Google! 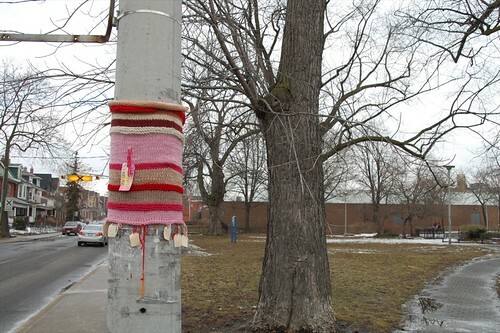 I just found out that this Guerilla Knit Up is the handiwork of Martha Brown. You’ll notice that she even added paper tags and a pencil, so people have been adding their comments. You made my day today, Martha! Omigoodness! Lovely! I read the book “Handmade Nation” right after the Chritmas holidays and I remember reading about these random knittings! I love it! I am so glad it’s come to Toronto! I’m glad that you saw it Karyn! and that you liked it — I was thinking of you while I was sewing it up there (in -20 weather). there were lots more tags too — but someone ripped them off (but luckily just left them on the ground, so I rescued them!) I’m on my third pencil too! I’m just finishing up another 2 knit ups — one more for that park, and I haven’t decided where the next one will go! (maybe Dufferin Grove, maybe somewhere in Kensington… I’m open for suggestions! I’ve read the ‘Handmade Nation’ book and I’d love to watch the film… I don’t think it will premiere in Portugal though… 🙁 Maybe someday I’ll be able to watch it online? Let’s hope so! I LOVED the opening title sequence!! Thanks for the link. Have a lovely weekend, Karyn! In Lisbon it’s Spring already! 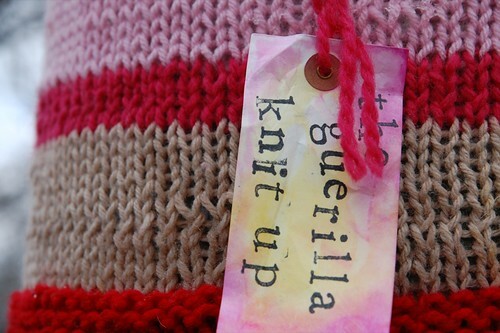 In response to your entry on guerilla knit up, i thought i’d let you know about my friend leanne prain’s new book coming out with Arsenal Pulp Press. it’s called Yarnbombing. Their website is listed above. Enjoy! i spotted this last week as i was frantically rushing to a meeting. it made me stop and smile and then slow down my pace and take in the day.